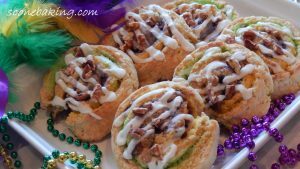 King Cake Scones are a delicious twist on one of Mardi Gras traditions, the King Cake. Each scone will have all three Mardi Gras colors: Purple – Justice, Green – Faith, Gold – Power. 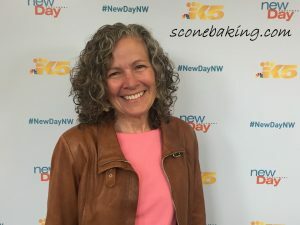 There are candied pecans in the filling, and each scone is topped with a bourbon-vanilla icing and toasted pecans. Enjoy! 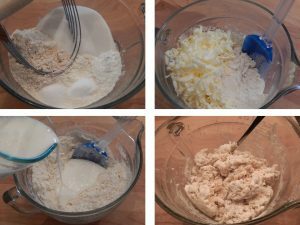 SCONES: Meanwhile, in a large bowl mix together flours, sugar, baking powder, baking soda, salt. Cut in frozen butter. Add buttermilk and mix until just together (do not overmix, the dough is very loose). 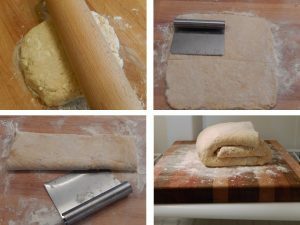 Take dough out of the freezer and roll into 12″ square. Brush on melted 2 Tbsp. butter, cover entire dough. Cover the bottom 8-inches of the dough with wax paper. Sprinkle top 4 inches with green sanding sugar. Cover green sanding sugar and the bottom 4-inches with wax paper. Sprinkle the middle 4-inches with yellow sanding sugar. 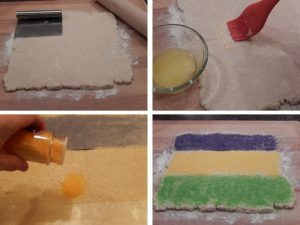 Cover green and yellow sanding sugar with wax paper. Sprinkle the bottom 4-inches with lavender sanding sugar. You should have 3 rows, 4-inches each, of colored sanding sugar. 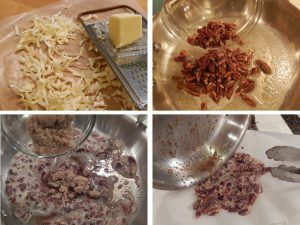 Break up candied pecans in parchment paper; sprinkle evenly over sanding sugar; gently press in dough. 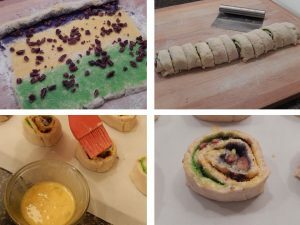 Roll dough like a cinnamon roll, into a tight 12-inch long log. Cut log into twelve 1-inch pieces. Place cut-side down on a baking sheet. Brush tops with 1 beaten egg. 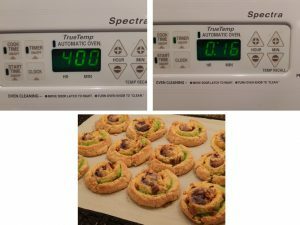 Bake at 400 degrees F. for 16-18 minutes (until golden brown and delicious). Remove scones with parchment onto cooling rack. Cool completely. ICING: Once scones are cool, whisk together 1 Tbsp. softened butter, bourbon, vanilla extract and powdered sugar with a whisk until smooth. Put icing into a ziplock bag, cut a hole in the corner and drizzle on scones. 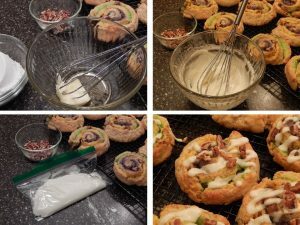 Sprinkle iced scones with toasted pecans.